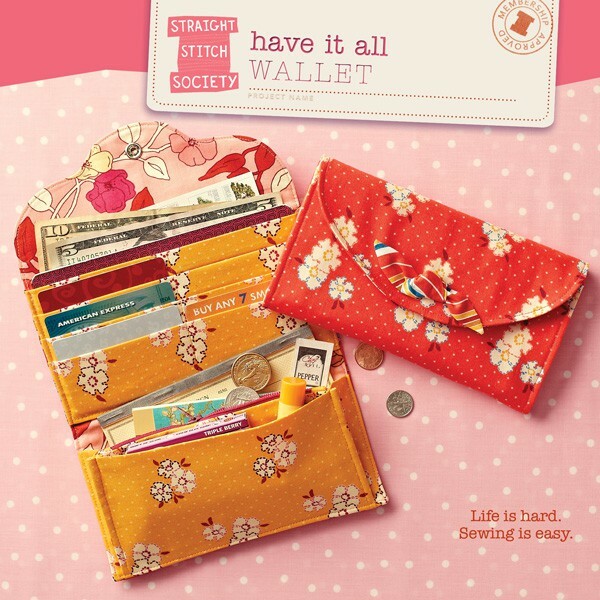 Share your photos on Instagram with the hashtags #haveitallwallet and #straightstitchsociety. I ordered several of these patterns for a class my shop was giving and all of the girls loved the pattern and all went home with a finished wallet! 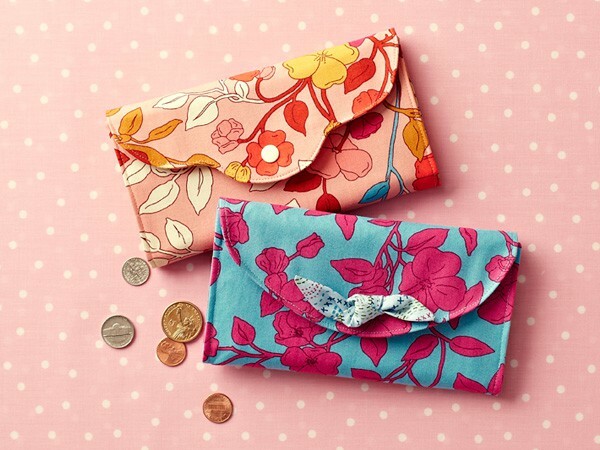 Great wallet and easy, quick,and easy to make! I had never sewn a wallet before. And this wallet was a-m-a -z-i-n-g! I just cannot believe how well put together it is and how easy it is to put together! Thank you so much!! 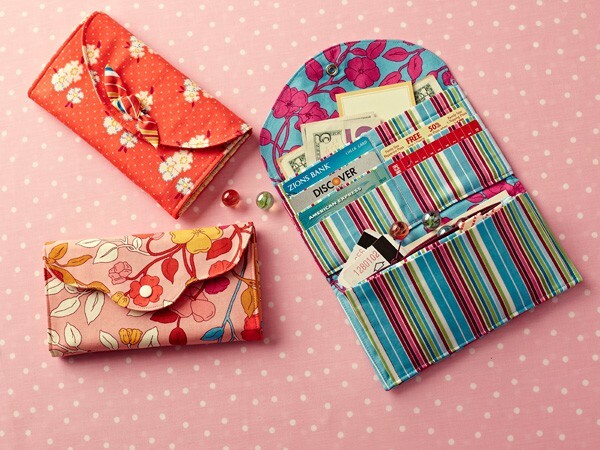 This is a great, no fuss, easy wallet to sew. My new favourite pattern. I really like this pattern, but I first had to make a few adjustments. Once I customized it, it has become a favorite go to. Love how this pattern turned out. I can't wait to make more in different colours. Overall the instructions were clear, and the result is a very handy wallet with plenty of space for everything. I think next time I might use a heavier interfacing for the card pockets, so they're held in a bit tighter. The instructions for installing a magnetic snap could be a bit clearer, as well as those for folding and sewing the card pockets. All in all though, a great pattern! I was mystified by the lack of a finished edge in the top of the accordion pocket, just a fused edge? Also the placement of the zipper pocket, Placed at the bottom edge of the wallet back that seems to leave a large piece of fabric hanging. The diagram on the previous page shows the zipper pocket at the the upper edge of accordion pocket. How did others handle that? I turned it behind the zipper pocket and made another pocket. I like my completed wallet. It was a bit like solving a sudoku—thinking and planning were required. In the future, I will experiment with different interfacings. I used velcro for my closure and sewed it in before stitching everything together. Sewing a snap on at the very end would be challenging. I love the finished wallet, but had trouble understanding the written directions for the zipper portion of the pattern. However, with help from a friend, we figured it out and were good to go. I've whipped up four wallets and taught some friends how to make it, as well. I've made some adjustments to the pattern, including streamlining the cutting out and interfacing prep process. I've also used fusible fleece on the outside of the wallet so I can quilt it and substituted a heavier interfacing to add some substance to the wallet lining and pockets. I've even added a removable wrist strap and am toying with adding a back pocket for my cell phone. The bones of the pattern are great and with some tweaking, it has become my new favorite. 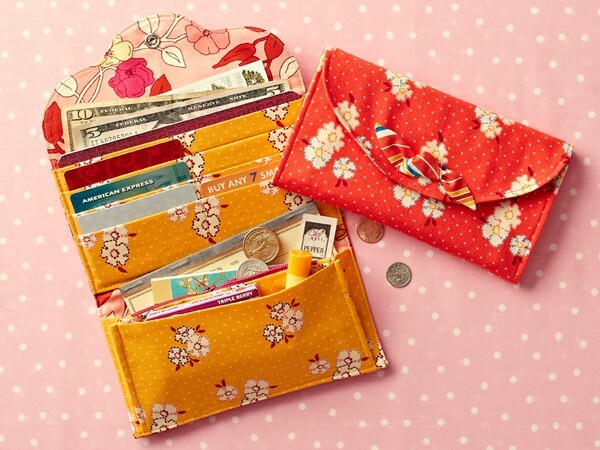 I really like this pattern - it makes a lovely wallet and I'm absolutely sure I'll be making more as gifts. I did get stuck on one aspect of the pattern (setting in a snap) but I had a prompt response to my problem which immediately helped me to see where I'd missed a step which is in the pattern guide. And I proceeded to make the wallet from start to finish that evening. Having made my first wallet, I think I will use even firmer interfacing for the outer part, and perhaps the accordian pocket, next time but that's just about the ways one starts to personalise and change things to a pattern when it's a delight to sew. As has been indicated with other reviews, the hard part is making fabric choices! That pattern is very clearly written. I was rather intimidated at the idea of making a wallet but with the step by step instructions it was actually a fun project. I am looking forward to making a few more. I want one for myself, the hardest part will be finding the material that I want for it. I did modify the direction of the cc pockets after reading another poster's review. I can't say how much I loved this pattern. It was so easy to follow, and the instructions were much easier to follow than a store-bought pattern. The small size of this project made printing the pattern pieces out at home a breeze. I followed all the directions and bought the super thick interfacing, which I would definitely recommend. I've been using my wallet for a month now and it works so well. I've been showing it off to anyone who will listen. Loved it! Pattern is thorough and easy to follow, with lots of options to customize by choosing different fabrics. Amount of different pockets is great; the wallet may be a bit floppy if interfacing is substituted. A great pattern. 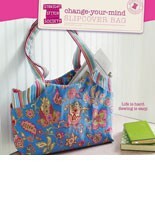 Love the fact that it can be made funky with beautiful fabrics. My first one is nearly finished. 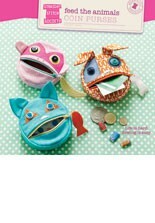 Great pattern, fun to sew! Makes a really special gift. Will definitely make more than one! This was a fantastic pattern, easy to follow, interesting and fun and very satisfying! What a lovely wallet. Thank you so much! Great pattern easy to understand instructions have made 2 with a few more to go, Christmas gifts! I needed a new wallet and I love Oliver and S so I went for this one also designed by Liesl! I was not disappointed! Made the wallet in a couple of hours. Instructions clear and easy to follow. I did trace the pattern pieces rather than cut up the original. Also used a strip of touch-and-close tape rather than the snap fastener and it works very well. Only slight drawback is that if you're getting coins out then unless you're careful your cards are upside down and at risk of falling out. Will modify pattern if I make another one. This pattern is very detailed and flows nicely. I had a little trouble following around step 14, mainly because the pieces are named so similarly. I chose to place my bottom snap prior to sewing the outside wallet pieces together. I did not want it show through the accordian pocket. Placement was difficult. Also, I did not place the top snap low enough on upper lip and it puckers up a bit. I added a driver's license slot to the front of the accordian pocket because that is a feature of current wallets that I really like and would miss on this pattern. I would definately use heavey weight stablizer on the wallet. I used medium/heavy weight fuzable stablizer and it doesn't feel as durable as manufactored wallets. This is the third wallet pattern that I have made and is by far the easiest, most detailed pattern I have used. With a few tweeks, it is easy to perfect and is a nice, useable product. This pattern is fantastic! The instructions are super easy to follow with great diagrams for nearly every step. The pattern itself is so clever! I have made probably half a dozen different wallets before, and this by far is my favorite pattern. Really pleased with the finished result. The instructions were very easy to follow. Thank you. This is a great pattern that sews up elegantly and comes together pretty quick. It could be improved by simply listing all the various sizes of rectangles that need to be cut instead of having to cut out template pieces. I found myself doing that anyway before I began. I also increased the width of the pieces by 1/2 inch all around as the card pockets were a little too snug for me. I have made 7 of the wallet and only had to change one thing. I added heavier sew in facing for the back. The original was not thick enough. T am going to try to add another flap for credit cards going the other direction and sewn in under the bottom of the original cc pocket. The directions and pics were very easy to follow and well written. Plan to make more for gifts. Love it!!!! The first printing of this pattern contained a minor error in Step 1. The first bullet point should call for two strips of interfacing 1" wide x 6 3/4" long (not 6 1/2" long). The first and second printings of this pattern contained a minor error in the supplies list. The piece of extra firm woven sew-in interfacing must be 9" x 13" (not 7" x 13"). A selection of your photos from the Straight Stitch Society Flickr group. 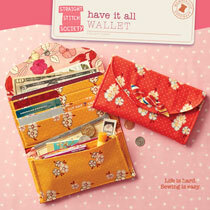 Find and share more photos on Instagram using the hashtags #haveitallwallet and #straightstitchsociety.